FEW DAYS after Jesus met his followers or disciples at the river Jordan, he came with these men to a town in Galilee called Cana, to be present at a wedding. In those lands a feast was always held at a wedding, and often the friends of those who were married stayed several days, eating and drinking together. The mother of Jesus was at this wedding as a friend of the family; for Nazareth, where she lived, was quite near to Cana. Before the wedding feast was over, all the wine had been used, and there was no more for the guests to drink. The mother of Jesus knew that her son had power to do whatever he chose; and she said to him; "They have no wine." Jesus said to her: "O woman, what have I to do with thee? My hour is not yet come." "Whatever he tells you to do, be sure to do it." "Now draw out some of the water, and take it to the ruler of the feast." "At a feast everybody gives his best wine at the beginning, and afterward, when his guests have drunk freely, he brings on wine that is not so good; but you have kept the good wine until now." This was the first time that Jesus used the power that God had given him, to do what no other man could do. Such works as these were called "miracles"; and Jesus did them as signs of his power as the Son of God. When the disciples saw this miracle, they believed in Jesus more fully than before. After this Jesus went with his mother and his younger brothers to a place called Capernaum, on the shore of the Sea of Galilee. But they stayed there only a few days, for the feast of the Passover was near, and Jesus went up to Jerusalem to attend it. You remember that the feast of the Passover was held every year, to keep in mind how God had led the people of Israel out of Egypt long before. 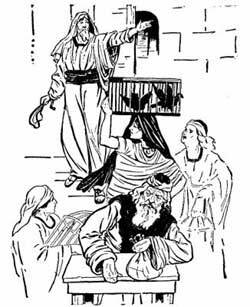 When Jesus came to Jerusalem, he found in the courts of the Temple men who were selling oxen and sheep and doves for the sacrifices, and other men sitting at tables changing the money of Jews who came from other lands into the money of Judea. All this made the courts around the Temple seem like a market, and not a place for the worship of God. Jesus picked up some cord and made from it a little whip. With it he began to drive out of the Temple all the buyers and sellers. He was but one, and they were many; but such power was in his look, that they ran before him. He drove the men and the sheep and the oxen; he overturned the tables and threw on the floor the money, and to those who were selling the doves he said: "Take these things away; make not my Father's house a house for selling and buying!" The acts of Jesus were not pleasing to the rulers of the Jews, for many of them were making money by this selling of sacrifices and changing of money. Some of the rulers came to Jesus and said to him: "What right have you to come here and do such things as these? What sign can you show that God has given to you power to rule in this place?" Jesus said to them: "I will give you a sign. Destroy this house of God, and in three days I will raise it up." Then said the Jews, "It has taken forty-six years to build this Temple, and it is not finished yet. Will you raise it up in three days?" But Jesus did not mean that Temple on Mount Moriah. He was speaking of himself, for in him God was dwelling as in a temple, and he meant that when they should put him to death, he would rise again in three days. Afterward, when Jesus had died and risen again, his followers, the disciples, thought of what he had said, and understood these words.